The latest issue of GLINT includes a great piece on a recent social media project undertaken at the Oireachtas Library & Research Services. Laura O’Broin's article can be read in full online, but one aspect of the study caught my attention in particular. The survey used as part of the project provides insight into how and why professionals use social media in the work environment. The results classify the use of social web applications by type and purpose – most notably distinguishing between the reading and creation of content. Unsurprisingly, the former dominates. Providing information to clients was also the least popular type of usage indicated by respondents – a little surprising given the obvious strengths of some of the applications included in the study (Twitter, Blogs, Podcasts, Slideshare, Wikis). Whilst social media has now become a routine access point, its capacity to activate latent and reluctant writers still appears to lag some way behind. But without people who are willing to create and share content and information, there would be nothing to access. 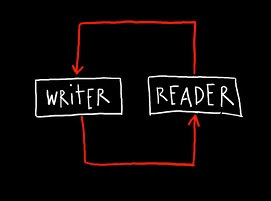 So what are the barriers preventing the transition from reader to writer? It is likely that the challenges identified in the study have a part to play. These include trust and privacy concerns, variation in the level of user expertise and interest, and a lack of formal policies and guidelines clarifying exactly what is considered as appropriate professional use. The syntax of the web also follows very different rules to those of the print world, and writing and communicating effectively online requires unique competencies and literacies. The subtleties of social media netiquette can be somewhat opaque; for example automating your corporate Twitter feed to your Facebook profile is generally unadvised. Not only does the duplication of content annoy those following your organisation using multiple services, but more importantly, these tools are designed to communicate in different ways. A tweet is not the same as a Facebook status update or a blog post, and the information being communicated should reflect the distinct purpose of each. Just because you can automate and duplicate content with a single click, doesn’t mean you should. Think about how, when and why your users are receiving your content. As well as eroding these obstacles, we can look for catalysts to expedite the process. Concrete examples from authoritative sources can help to sway the non-committers. For example posts such as "I’m an academic and desperately need an online presence, where do I start?” from the LSE’s Impact blog lend obvious weight to the arguments (after all, who could possibly disagree with the LSE? ;)). But the benefits in terms of knowledge transfer, social learning, engagement, innovation and discovery should largely speak for themselves. If you are worried that people might try to steal your ideas if you publish them openly on the web, don't be. You should be more worried if they don't try to steal your ideas. I think it holds a lot of potential for librarians. Thanks a lot Anne! That's a very interesting piece. In medicine, the chances are that somebody out there probably has come across a case report before. The information may be there but it is discovering or accessing it that is the problem - hence the power of social networks! Ever since I read James Surowiecki's The Wisdom of Crowds a good few years back, I have believed there is great potential for leveraging networks to make better or faster decisions. It potentially feeds into so many areas too - like post-publication peer review (a future blog post, no doubt! ).